The SNP has called on the Scottish Government to use part of the £11m underspend in last year’s fisheries aid package to fund an action plan for Scotland’s harbour businesses that have been hit by the two vessel decommissioning schemes. The call came as the SNP revealed that only 11% of the £1.8m, First Minister Jack McConnell made available for the onshore sector was ever paid out leaving a short fall of over £1.6m. “In the run up to the 2003 elections, First Minister Jack McConnell promised to help harbour businesses survive the latest decommissioning scheme that slashed the size of the white fish fleet on which many small companies throughout Scotland depended. Over a year later, it transpires that only a fraction of the £1.8m available has been paid out to the scores of small firms based around the country’s harbours to help them survive. “For every fishing job at sea, there are six ashore employed by the engineering companies, painters, netmakers, harbours and other employers that rely on the fishing fleet for business. Despite taking away their customers, Jack McConnell and Ross Finnie have left these firms in the lurch. “It is vital we have focussed support for diversification and wider accessibility of funds for retraining. The fishing industry indirectly supports a whole range of businesses around the harbours, in our coastal towns and beyond into the rural community. Note: Parliamentary Answer S2W-08009 states that only £198,920 has been paid from the £1.8m made available for businesses in Aberdeen, Buckie, Eyemouth, Kinlochbervie, Lochinver, Mallaig, Fraserburgh, Peterhead, Shetland, Ullapool and Wick affected by events in the white fish sector. First Minister Jack McConnell announced the scheme on 11 March 2003 during a visit to Aberdeen. Banff and Buchan MSP Stewart Stevenson has asked a series of Parliamentary Questions on the issue of Myalgic Encephalomyelitis (M.E.) to coincide with M.E. Awareness Week. “Information and support services are needed by people with ME, carers and health professionals. Even if you do not have ME or use services yourself, you can help others by telling them about existing services. I am certain that M.E. Awareness Week will achieve its aim of making more people aware of M.E. and also enable people to understand what it is like to actually have M.E. “Campaigning in this area will help to improve the situation for people with M.E. Regrettably, there is no treatment for M.E. although there are many different alternative therapies available. Like many others though, I believe that the best thing an M.E. sufferer can do is to learn to manage their illness effectively. S2W-7493 Stewart Stevenson: To ask the Scottish Executive how many people there are with myalgic encephalomyelitis in (a) Scotland and (b) each parliamentary constituency. S2W-7494 Stewart Stevenson: To ask the Scottish Executive what initiatives it is supporting in connection with the Myalgic Encephalomyelitis Awareness Week, May 2004 campaign. S2W-7495 Stewart Stevenson: To ask the Scottish Executive what action it will take in response to concerns about current treatment and resource provision in respect of myalgic encephalomyelitis, as referred to in a recent report published by the 25% M.E. Group, Severely Affected M.E. Analysis Report on Questionnaire Issues January 2004. S2W-7496 Stewart Stevenson: To ask the Scottish Executive what plans it has to extend the resources available to primary healthcare providers for the treatment of myalgic encephalomyelitis. Shadow Fisheries Minister and North East SNP MSP Richard Lochhead and Banff and Buchan SNP MSP Stewart Stevenson will be visiting Fraserburgh Engineering tomorrow morning to call for an action plan to help the fishing industry's onshore sector which has been ignored by the Scottish Government despite suffering due to the recent fisheries decommissioning scheme and challenges facing the industry. For every job at sea in the fishing industry there are at least six onshore. The SNP will also reveal that only a fraction of the support for the onshore sector promised by Fisheries Minister Ross Finnie and First Minister Jack McConnell as far back as March 2003 has been paid out. The media are invited to attend a press briefing at 10.00am on Friday 28 May (tomorrow) at Fraserburgh Engineering. Unit 19, Reclaimed Ground, Fraserburgh. Banff and Buchan MSP Stewart Stevenson has supported a Parliamentary motion highlighting the concerns that Scotland has the world’s highest incidence of asthma in children, as revealed by the Global Initiative for Asthma. “It does not make for good reading to learn that the children of Scotland have the highest occurrence of asthma in the world. As well as this being bad news health wise, it is also bad news financially for Scotland. “Research carried out by the National Asthma Campiagn Scotland suggests that approximately, asthma costs Scotland £194.9 million per year and that 3.5 million asthma sufferers in the UK say that traffic pollution aggravates their concdition. The pollution factor is most definitely an area which requires further research in order to reduce the number of those which suffer from asthma. Banff & Buchan SNP MSP Stewart Stevenson has welcomed a response received from US brewing giant Anheuser-Busch – producers of the Budweiser brand – to use Scottish farmers to grow some of their barley requirements. The MSP approached Anheuser-Busch following a meeting with North-east farmers where concern was expressed at the possible impact on cereal growers following the closure of the Fountainhall brewery in Edinburgh by Scottish & Newcastle. “The grain used in the manufacture of Budweiser in the UK is imported due to the brewer’s wish to standardise the type of barley used for all its operations worldwide to ensure a consistent taste and standard. “I put it to the company that North-east farmers would be very willing to accommodate their specific grain requirements and asked that this be considered. “I have now received a reply from Colorado confirming that they will study the option to use source barley from Scotland, subject to the necessary disease-resistance specifications being met. Banff and Buchan MSP Stewart Stevenson is seeking nominations from constituents for a representative from Banff & Buchan to participate in the official procession from Parliament Hall along the Royal Mile to the Scottish Parliament building in Edinburgh, as part of the opening ceremony of the new parliament building. 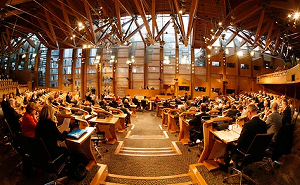 “I have been asked by the Presiding Officer of the Scottish Parliament to nominate one person from my constituency who has made a contribution to the lives of other Scottish people either locally or nationally to participate in the procession as part of the opening ceremony of the new Scottish Parliament building. “I am fully aware of the controversy which has reigned over the cost of this building, and my party and I have voted against the constant price increases at every opportunity. However the building is now with us and we must ensure that this is seen as a building for all Scots, not just Parliamentarians. Banff & Buchan SNP MSP Stewart Stevenson, has called for fewer regulations from the European Union. The MSP said that too many regulations are now coming out of Brussels, and that many of these have no tangibly positive effect on people’s everyday lives. “The issue that makes the biggest contribution to anti-European feeling in this country is the number and extent of EU regulations and laws that affect businesses and people. The problem is that all those regulations and laws arise from general principles to which the UK Government has happily signed up, such as those that are designed to free up competition and to improve transport and the environment. “However, do we have to translate those general principles into quite so many and quite such detailed regulations? Would not the EU be just as effective if, say, 33 per cent of those regulations had never seen the light of day? Would we be any worse off as a country or as individuals? “Although some of the stories about regulations that are allegedly put forward by the EU, such as the misleading story about the straightness of bananas, have a dubious basis in fact, it is true to say that the European Union promulgates thousands of new rules every year. “In certain cases, European regulations may prove to be contrary to the interests of people and businesses in Banff & Buchan, but in general the problem is the sheer volume of laws that have minimal affect upon the quality of life of people in Scotland, except to make that life more complicated than it need be.